Efficient engines deliver greater MPG, reduce carbon emissions. Easy access to controls with many directly on the steering wheel. When it comes to moving freight, drivers make it happen. So finding the best ones is a critical strategy for trucking companies. Recently-enacted federal safety rules, while needed, have further deteriorated the already shrinking pool of safe drivers. 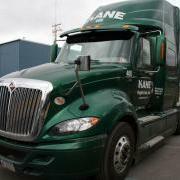 A strong recruitment program is paramount to the success of a transportation solution provider such as KANE. That's why investing in the fleet makes sense. It sends a powerful message to perspective drivers when a company is willing to invest in their safety and comfort. Driving a big rig is tough work for tough men and women, requiring them to be in their vehicle for the majority of hours they work. It's reasonable for them to expect that, in return, they are as comfortable and as safe as possible when away from their home and loved ones.